The main square in Hamar is not a quiet place. On the contrary quite a few activities meet exactly at this point. Transports of goods, crossroads and people in passing, marketing, shopping, patrons of cafés and those who just want to watch people and the busy life from one of the benches in the square. People, cars, commerce, work, social life and leisure – everything that is going on in this town sooner or later will appear in this square. With the new and attractive library there most certainly will be even more people crossing the square, eager to visit the library and its inviting premises with all kinds of interesting activities. These visitors, as well as others, will feel a need to stay for a while in the surroundings around and outside the library. To read the book they have borrowed, to wait for a friend, or just linger in this much frequented and exciting area. In our suggestion for the main square in Hamar these two aspects have been most important to us and they are also closely related. First, we think of the new library as the important change in Hamar. Second, and as a consequence to this, the main square has to be re-defined and re-constructed as a really new and social space with the library as cardinal point, not only in the square, but in the town-centre. A space for people, not for big vans, buses and cars. We believe that the new library with its open and contemporary look and its multiple fields of activities is an important building for the citizens in Hamar but also for visitors and tourists. We have taken it upon ourselves to create forms that will highlight the square and help to define it as a public space. Artistic forms that we hope will act and interact with the citizens and become a distinct visual profile for Hamar. 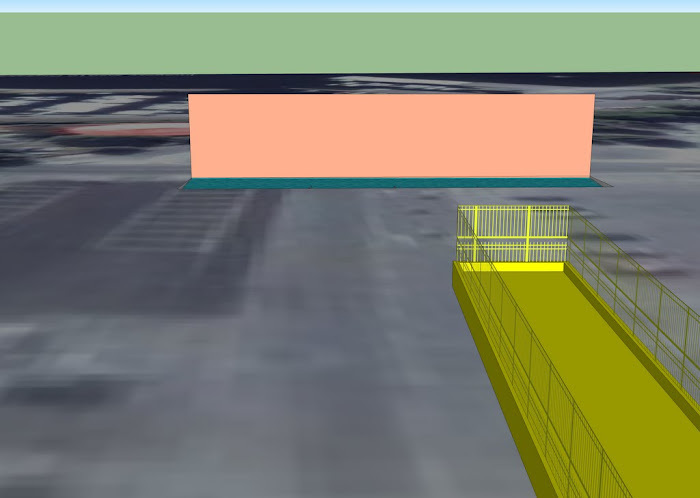 We have worked with two large-scale forms, a bridge overlooking not only the main square but also lake Mjøsa and a plane surface set up in front of The Old Market. The plane is used during the summer-season as base for a powerful waterwork. In the winter the plane is lowered to the ground and then functions as an urban ice rink. The bridge and the plane surface are both energetic expressions that clearly define the new square and its ambitions. Having climbed the steps up to the height of 6.2 meters the visitors can enjoy the view of the lake as a means to open their minds, or they can endulge in observing people in the square. The viewers themselves, as they walk along the bridge up to the panorama-view, become part of the bridge and can be seen from the ground. From their high position they are able to see the sun set over Mjösa and enjoy the full effect of the waterwork creating a rainbow-like mirage as the strong jet of water hits the metal plane in front of The Old Market. Perhaps every town dreams of becoming something different from what it is. In Hamar an important step already has been taken to make a vision come through. A library provides the citizens with opportunities to explore and intellectually benefit from books, papers, films, music, media and different networks and look ahead. And just as important, the library is open to everybody and is free of charge. It is a unique place in an otherwise commercial center, and therefore very important for young people who seldom have much money to spend. In our suggestion we want to transform the main square to a really public space where people can meet, literally on many levels, and enjoy different urban activities at the same time as they can get a closer connection to the lake-scape. The main square, as profiled place and public space, opens up for “the bigger splash” where Hamar shows its ambitions and confidence for the future. Our suggestion entails the removal of all small buildings and bus-shelters from the square to the new bus-stop area. We also want to remove all the trees in the square and pave the ground with cobblestone inserting three distinct lines of limestone that encircle the square. We want to turn the main square into a beautiful and open space without any cars, a space that is easy to overlook and just as easy to get across. The square as an open space also highlights the sculptures, or should we call it architecture with a function, the bridge, the wall/plane with water and ice. In the wintertime the ice rink connects to Hamar´s worldfamous interest in skating. The wonderful sculptural building, Vikingskipet from the Olympic Games, is the obvious example of this interest. In the main square the skating is “admission free” and kids as well as adults are free to skate in the middle of the city. 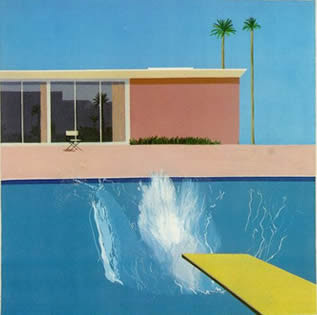 Our suggestion “ A Bigger Splash” is not altogether sculpture, not entirely architecture and absolutely not landscape architecture, it is something in between these three and also of practical use. It is an extensive suggestion that entails changing and de-routing the traffic, cars as well as buses, moving and/or pulling down small buildings, paving the whole square and finally building two large-scale sculptural forms.